Sage has come of age. Much to my delight, he’s been deemed ready for conveyance by bike trailer – so long as we keep to bike paths for now and take things very easy. Hauling this form of cargo is new to me, so I’ve been researching the options over the last couple of months. The upshot? A Chariot CX1 has now joined the Tout Terrain Mule in the trailer stable (though the for off road riding, the Singletrailer is on the wishlist too). 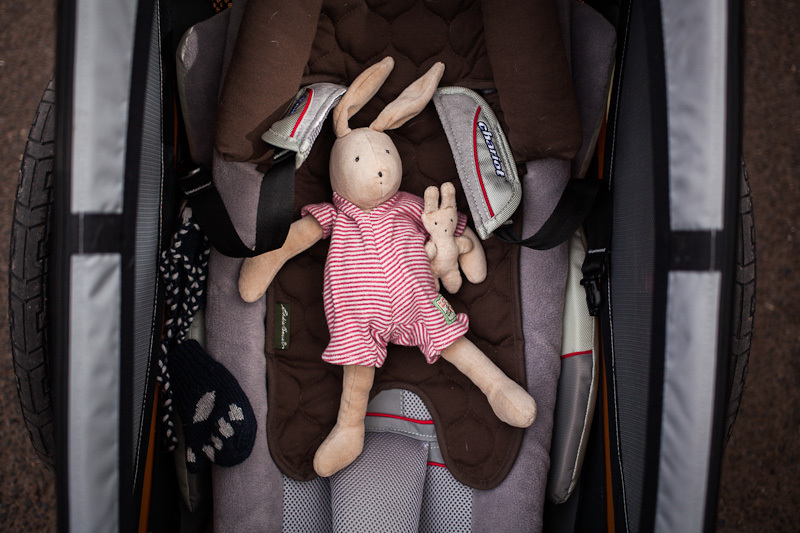 As anyone who knows a thing or two about child ferrying may be aware, these Canadian-designed trailers are considered be the crème to la crème of the baby trailer world. As well they should be: the CX1’s eyebrow-raising price tag of $850 is for the chassis alone, not counting all the parafernalia of extras. However, it’s true to say that Chariot’s reputation stands pretty much unmatched. 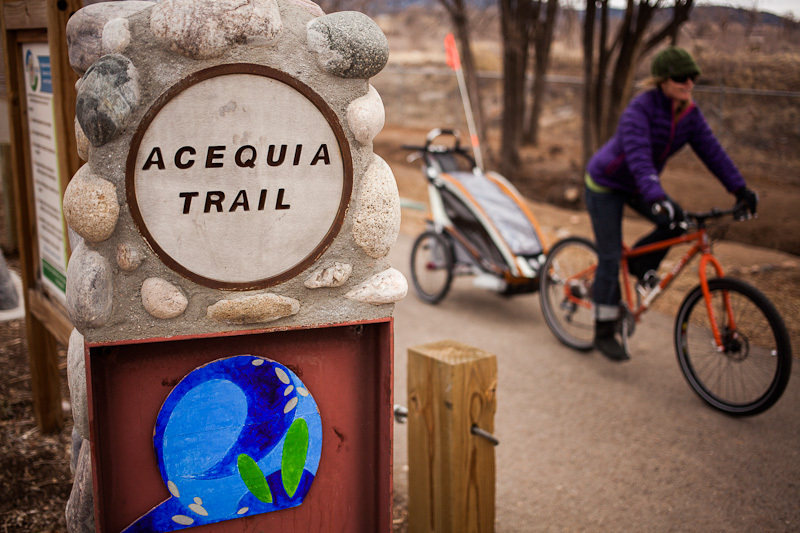 Their trailers have a weight-adjustable suspension system, and can be used for everything from strolling to skiing to jogging to riding. Over the years, I’ve seen them adventuring all around the world. Megan and Neva brought their Chariot Cougar to Nicaragua, and Steve Tober, my source of family biking inspiration – has one in Ecuador. For an in depth review, check out Travelling Two – recent overseas travels include Cuba. Eric, up in Alaska, has really put his through the grinder. Our CX1 – the top of the line model, no less – is a 2011 trailer bought through bikeshophub at a healthy discount. The good news is that until they sell out, all the 2011/12 models are available for up to 35% off (aside from colours, there doesn’t seem to be much by way of changes between the years). The similarly-designed Cougar 1 is a couple of hundred dollars less and a popular touring model – it’s probably the best one to go for if you’re touring in cooler temperatures, as it doesn’t have removable side windows. If you shop for a trailer (or anything else) via this link, I’ll get a small cut, which I’ll put towards running the site. Thanks. Embarcation. After a few initial tears, entry into the trailer = near instant sleep. Chariot trailers feature an adjustable suspension system to ensure a supple ride over all kinds of terrain. This said, we’re keeping to smooth bike paths for now. 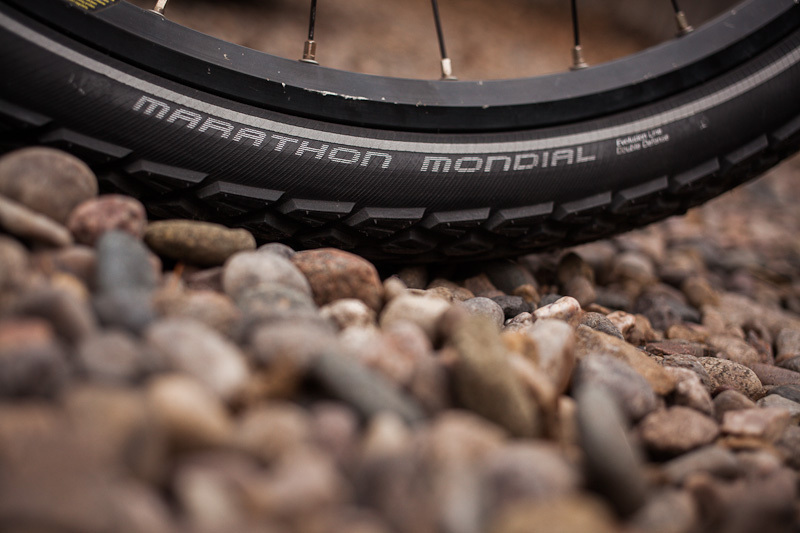 Nancy’s Troll is currently running Schwalbe Marathon Mondials – a sensible choice for city riding, touring and trailer-hauling alike. They’re fast rolling and relatively puncture resistant. A light and reflector compliment the trailer’s flag. Troll, Ogre and Chariot parked up at Counter Culture Cafe, Santa Fe. Sage emerges from Trailer Slumber. Appears intact. We’re using the padded Infant Sling, a baby hammock for infants 1-10 months old. 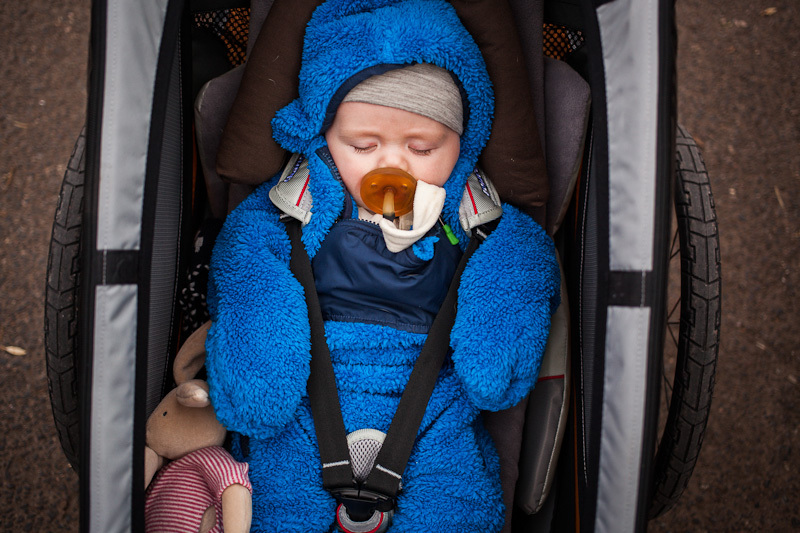 Officially, the sling is only recommended for the CX1 as a stroller. Having consulted with others, we’re happy rolling this setup on smooth bike paths too. All blueberries aboard. A few crocodile tears, then Sage is fast asleep once more. 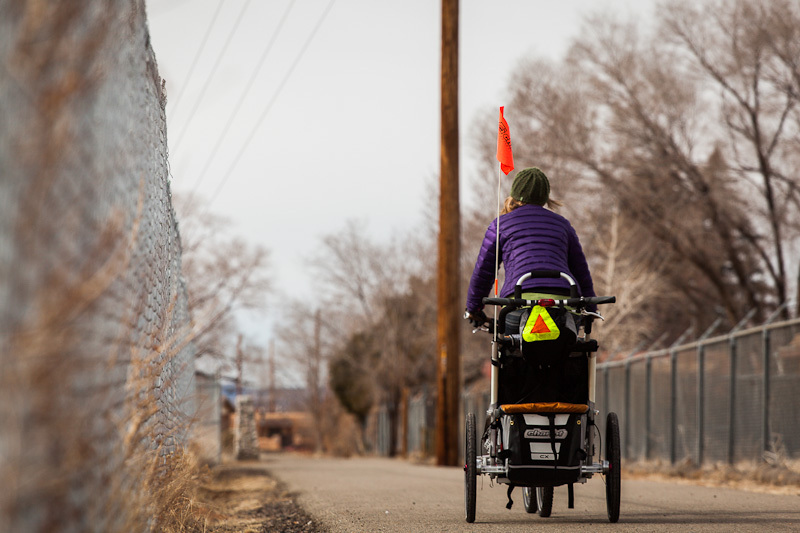 Santa Fe is relatively well connected by bike paths. Next up, we’ll be taking the train to Albuquerque and riding the bike paths there. First impressions? A definite success. The trailer won’t replace holding Sage for walking around town, but will hopefully usurp the car most of the time. Camera: Canon 5d Mk2 with 40mm f/2.8 and 70-200mm f/4 lenses. This entry was posted in Gear and tagged baby, Bike Shop Hub, Chariot Cougar, Chariot Trailer CX1, review on February 3, 2013 by Cass Gilbert. Congrats to the whole family on the first ride. It’s really an amazing thing to experience and will only get to be more fun over time. 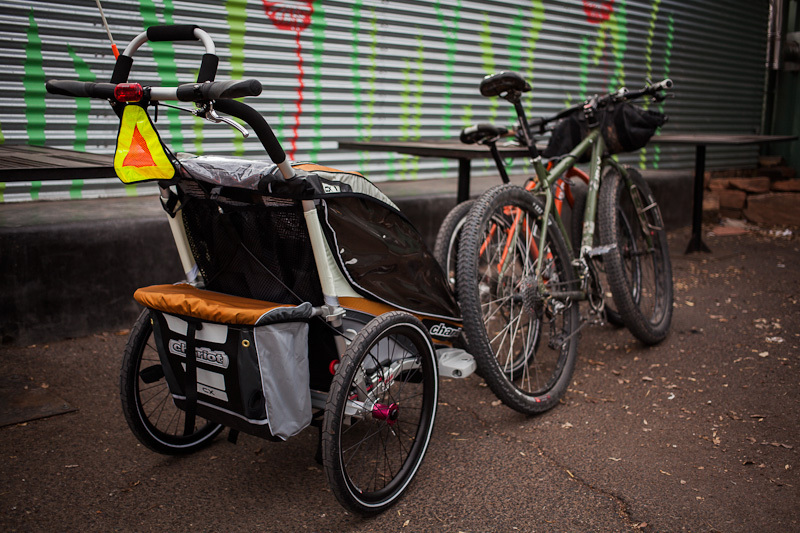 That Chariot looks like a super space-aged rig, especially compared to our old Burley. We have those same Robeez shoes, which have been excellent. 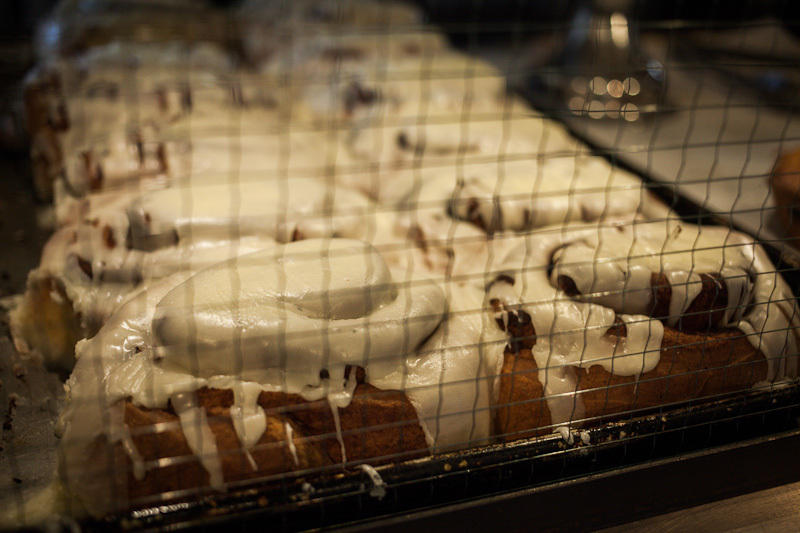 Are those cinnamon rolls of the gluten free variety? My hat is off to you if you have devised a way to make great gluten free cinnamon rolls. The Chariot is indeed something of a luxurious space pod. 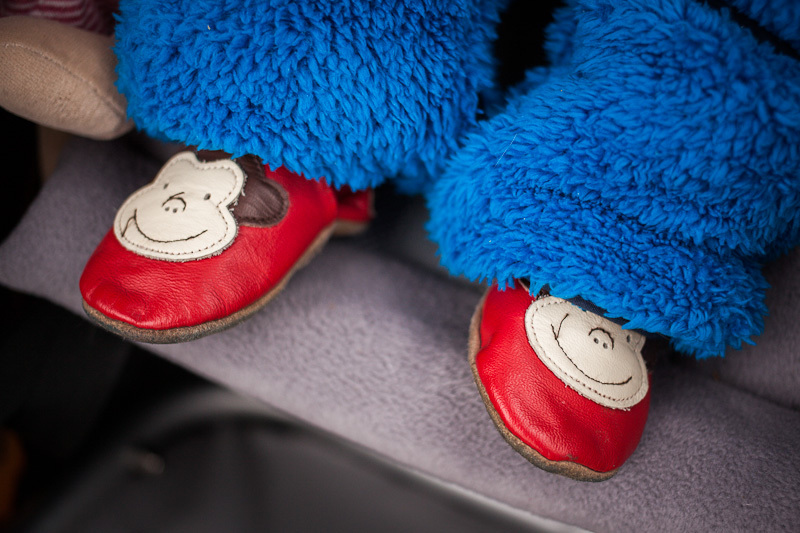 Apparently the Robeez Monkey Shoes were from a second hand children’s store in ABQ for $5. I had no idea they were such coveted baby footware! Sadly the cinnamon rolls were non gluten free. So I resisted. This time, at least. My regime does allow for some flexibility though, especially when I’m on the road. These particular delights are my favourite in Santa Fe. They are simply enormous, ample for two hungry cyclists, and cost $2.50 if a day old. The Chariot is the most essential item I’ve had as mom. I think of it more like an experience than a possession since it allows us to do so much. We have gone through 2 since our kids are 6 years apart. Our CX1 has been great except for a nut and bolt that seems to always come loose. But we beat it up having done trips with it around Costa Rica, home in Colorado and now as we have traveled down to Mexico. Have fun! Thanks Jen. I enjoyed reading your review! We’re looking at similar things – why didn’t you get the Cougar? Lighter seems better (we’ve got it in mind for touring, having met others in Patagonia doing multi-year tours that way). The Cougar would have been great too, but we were offered a killer deal on the CX! 2/ The rest of the weight is in the extra bag (which is kind of handy for now), fancier handlebar with Ergon-style grips and drum brakes. For a long tour, I’ll trim some of that back. 3/ the CX has removable waterproof side panels with a mesh side panel underneath. On the Cougar, it’s only the front that is removable. When Megan came to meet me in Nicaragua, she brought a Cougar. The heat proved to be a real issue for Neva, so when she got home, she ended up swapping it for a CX pretty much for that reason. Sounds like a small point, but she reckoned it was really important. From what I’ve read, it’s useful too if it’s rainy, as you can keep the sides open. The CX has a different kind of handlebar – could be good to strap a light but bulky roll bag to – like a sleeping bag. Depends if that effects the stability. When I chatted to the Chariot guys at Interbike, they were suggesting the Corsaire (http://www.chariotcarriers.com/en/US/Products/Touring-Series/Corsaire/CT_10100230) as it has more storage space for long trips. A bit heavier, but comes with the cycle mount included. A bit higher, so potentially less stable. No removable side panels though. This is awesome, and is a familiar winter route in Anchorage. Nice job Eric. Hey Cass….this is the post I’ve been waiting for. The Boo is over 6 months now and Noah is getting bike withdrawl. I think it is time to invest! Is there any reason not to go for the Cougar CX2 for the two of them. I have a bit of a weight asymmetry issue as Noah is 16Kg and the Boo is a tiddler at 8Kg. Will be good to get them out and head up and down St.Catherine’s Valley…will need to make sure the Rohloff is geared low enough though. Happy birthday for later in the week (25 again? 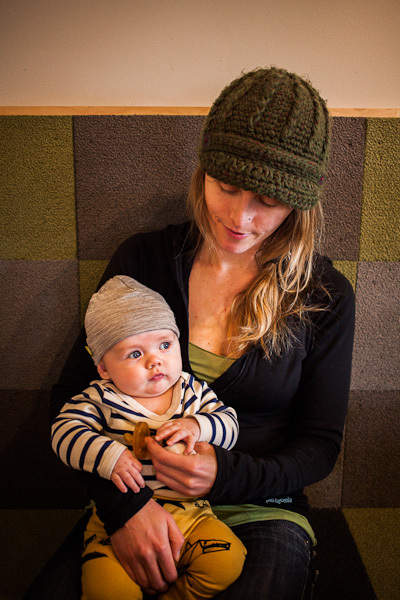 )…can’t wait to introduce Sage to the boys in due course. I’m no expert, but I think a double makes a lot of sense. It’s wider of course, but more stable too. That’s going to be quite a payload! 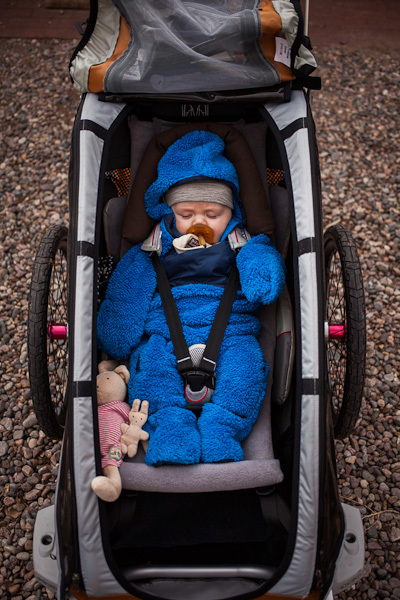 With the extra payload, you might find the CX2 worth the extra cash, as it has a handlebar-operated drum brake that useful for when it’s in stroller mode. Are you sure Chariot is a Swedish design? We’re Swedish and actually thought that the Chariot trailers are designed in Canada…?? Thanks! That’s a great site you have there, I look forward to checking it out. You’re quite right. Chariot is indeed Canadian, I made the Swedish connection as they’re owned by Thule. Thanks, Cass. Not much ‘on wheels’ on our site at present, but that will change. We look forward to following your updates on how the CX1 behaves out there in the real world. All three of us are running Mondials on our tour in Mexico/Central America and couldn’t be happier after 1,800+ KMs. They just don’t seem to wear… and as you mentioned they roll extremely well, which was a little surprising. Good to know. They seem a worthy successor to the venerable Marathon XR. What do you know about the Tout Terrain Single trailer? Did you consider that option? I definitely considered it, as I’m a big fan of the Tout Terrain Mule. I’d still really like to try one out, but they’re hard to track down here in the US. 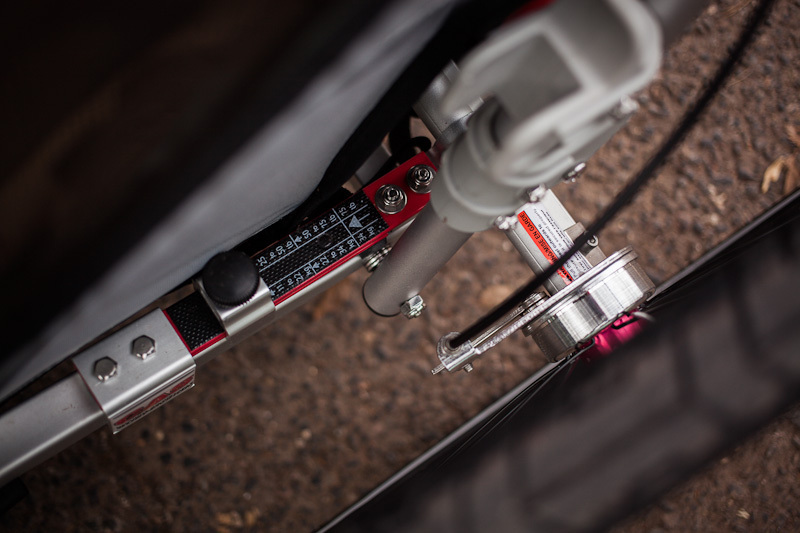 As a performance trailer, it sounds like it’s the best on the market, great for singletrack and dirt roads – and I really like the kickstand. For long distance travel, I wouldn’t expect it to be nearly as practical as a Chariot – for pushing around town, taking in an airplane or loading on the roof of a bus, for instance. Chariots are awesome! We’ve been using ours constantly since we picked it up second hand a little over 2 years ago… as a result, it looks much grubbier than yours. Ours is an old CX, and we love the side panel zips, they’re great for hot weather. Thanks – and yes, it doesn’t take long for them to get grubby if they’re being used properly 🙂 We might be getting hold of a Tout Terrain Single Trailer to try out this summer, so we’ll have to see how that goes. We were hoping it might open up some bike-packing-with-kid possibilities. Really enjoy your blog, have been reading it for a few months now, lots of good stuff. Thanks for sharing. Awesome trailer. How long before it gets pulled behind the Krampus? Matt, Sage began his trailer forays at the tender age of 12 weeks – well below the recommended age. However, we’re extremely careful where we ride with him – keeping to smooth cycle paths and riding slowly. 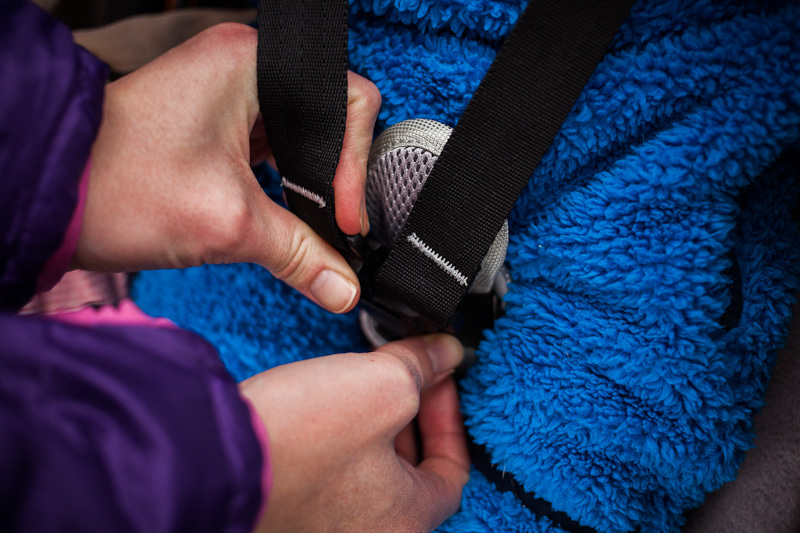 The Chariot has really good suspension, which smooth things out too, and we’ve added in an extra insert from the car seat, that helps to stabilise his head. We figure it’s similar enough to being pushed on the sidewalk – which round here is bumpier than the cyclepaths. Today, we took the trailer to a physio therapist he’s seen a couple of times – she was fine with it. I obviously can’t advise you to do the same, but I should say that Nancy is a very cautious person, and wouldn’t have given it the thumbs up unless she was completely happy. As soon as he’s older and ready to hit some dirt roads, it will be time for the Krampus/Chariot combo! you maybe don´t remember me. We where together on the way to Ladakh in summer 2005. Today I was remembering that travel with ny dauther, and I asked myself , about you. I found you here. Traveling and with one son, its your´s? Have fun, pura vida y a disfrutar!!!!! Nice post. 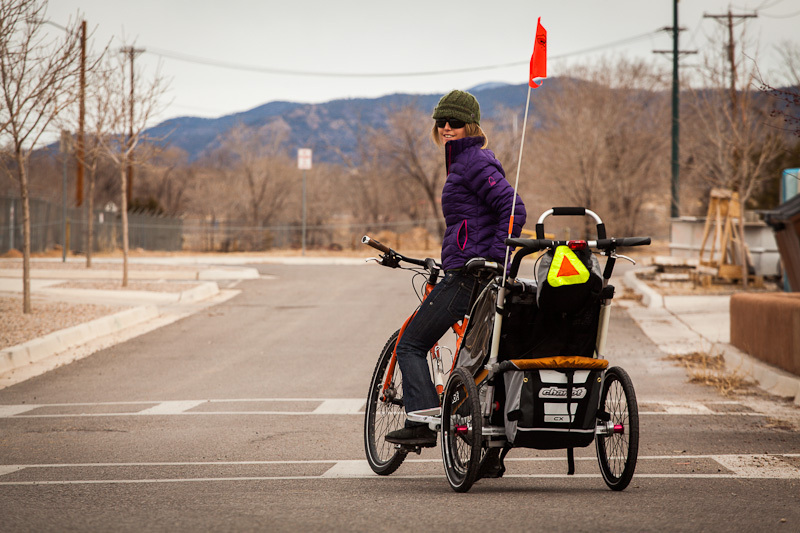 We too have been using the Chariot cx1 since our daughter was 3 months old (only on the bike trail). Loved seeing the photos… Just a quick question: Where did you pick up that Hi-VIs triangle? 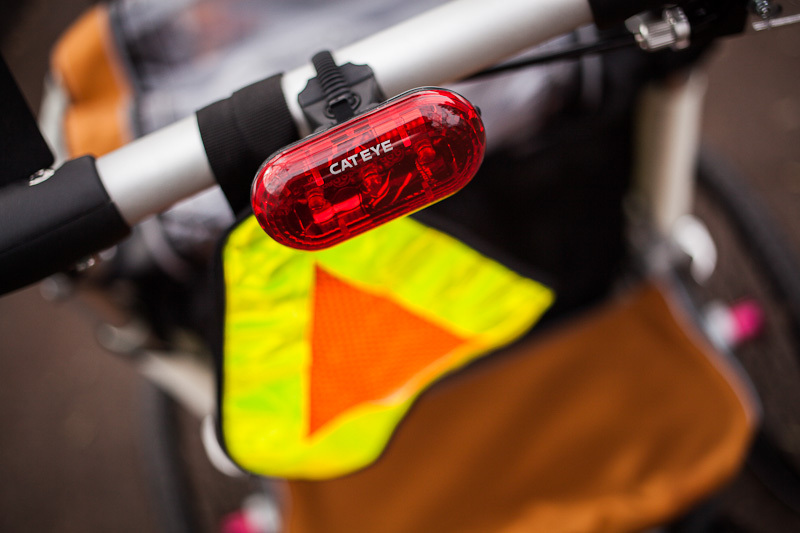 Nice touch, we just have a flashing light on the back of ours but there are sections of the bike trail that require you to use a bit of the road and would feel a bit more comfortable with that on the back. just bought CX1 last week. I would expect the stroller to be equally behind my bike. But the stroller is much on the left side. To express exactly I would expect left wheel to be 35 cm from the axis of my bike as well as the right wheel. Reality is that right wheel is 27 cm and left one 43 cm from the bike axis. I asked Chariot and send them picture, they told me this not right and advised replace the hitch arm. I did and the new hitch arm is completely the same. I tried to watch some videos and pictures and it seems to me that all CX1 are little bit to the side, but did not find exact straight picture. I’m confused, especially after message from Chariot. Could you tell me if the same issue is on your CX1? I don’t have the trailer before me, but from what I recall, the trailer isn’t completely centred behind the bike. I’m not sure how many cms off it from the central axis, but certainly not enough that it’s every been a cause for concern, or something I’ve ever noticed while riding. thank you for reply. If you have once chance to measure the out of center distance, I would be glad to know yours. I measured again my and it is 10 cm. Im getting contradictory messages from Chariot. Once they say it is NOK, second time they said it may be OK. Im confused. We bought the Chariot CX1 used; we had a MEC bike trailer single before. The Chariot does end up a little more to the left (towards the traffic), I would preferred if it was centered or, if not, more to the right (farther from the traffic). As for the MEC Trailer it was center, but was missing a lot of the great features from the Chariot line (mostly the CX). I too don’t understand why Chariot doesn’t know that their trailer is not centered to the bike; it must be a new staff that haven’t used the trailer yet?